Why reline when my chimney looks fine?!?! Many chimneys venting gas or oil furnaces or hot water heaters may appear to be in fine condition on the outside, but inside it could be a completely different situation. When the 80%+ efficiency furnaces were introduced, a new problem was created for chimneys - a moisture condensation problem. Yesterday's chimneys were not designed for venting today's more energy efficient appliances. Let's take a close look at what really counts… the inside. With today’s more efficient appliances, the exhaust is cooler and therefore rises up the chimney slower. Acid-laden moisture and residue has more time to collect on the interior walls of the chimney, causing deterioration. The picture shows that the original clay liner has eroded away; pieces of it are even missing. (Old chimneys might not even have a liner.) Mortar and bricks are loose and falling, and moisture has leeched through to the home's interior walls. We have seen many homes with moisture problems on the walls caused by improperly sized or faulty chimney liners. Chimney problems can cause illness and even loss of lives. With continued use, more erosion will take place, possibly leading to leaks in the flue, complete flue blockage, or even carbon monoxide poisoning of the home's occupants. It's happened thousands of times - illness, even death, from carbon monoxide or sulfur dioxide poisoning. With deterioration of the flue, the deadly gases can find their way into your home through even the smallest cracks. Thankfully, the problems of a deteriorating gas or oil appliance flue can be corrected without completely rebuilding your chimney. The solution is to install a properly sized chimney liner to service the appliances. A properly sized liner helps fumes to exit quicker, leaving less time for condensation. 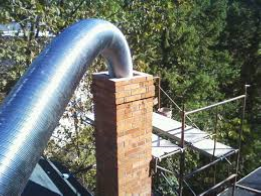 There are two materials approved as chimney liners for gas appliances - aluminum and stainless steel. Aluminum is the most common material used, with the only advantage being a lower up front cost. It is much cheaper short term, but can be much more expensive in the long run. It has been my experience that the aluminum liners have a very short life expectancy. When they first came on the market many manufactures of aluminum liners offered a lifetime warranty. Soon the warranties were shortened to 25 years then 15 years then 10 years. All of these warranties are on a prorated basis, covering materials only, not labor. In short, when - not if - your liner fails, the manufacture of the liner may say you are eligible for a few dollars toward the purchase of your next aluminum liner kit. In our 25+ years, we rarely see an aluminum liner last for more than 10 years. They quickly deteriorate due to exposure to the corrosive fumes from you furnace. They will usually last about 5 years, but we have seen some last less than 1 heating season!